brat annotation configurations are currently controlled by text-based configuration files that can be created and edited in any text editor. This page documents the configuration language. NOTE: we are planning to introduce GUI-based configuration in a future release, but have so far focused development efforts on other aspects of the platform as the need to alter configurations arises comparatively rarely and the brat configuration language is simple enough to write even by non-experts. Each annotation project typically defines its own annotation.conf. Defining visual.conf, tools.conf and kb_shortcuts.conf is not necessary, and the system falls back on simple default visuals, tools and shortcuts if these files are not present. The configuration files follow a simple line-oriented structure and a syntax familiar from many other text-based configuration systems. The top-level organization of the configuration files is into sections, each marked with a line containing only "[section-name]", where section-name is one of a set of predefined section names defined for the configuration file. Within sections, each non-empty line defines one configuration item, where with the first non-space sequence names the item, and the rest of the line the specification, which varies by section. Blank lines are ignored by the configuration reader. Similarly, lines beginning with the number sign "#" (also known as hash character) are ignored as comments. An example of a simple annotation configuration file defining two entity and two relation types is shown below. Each of these sections must be present in the configuration file, but they can be empty. For example, a configuration can define only entity annotation targets by leaving the other three sections empty. The [entities] section defines the types for the things that can be marked in text as types text spans, such as mentions of real-world "things" such as people or locations. In addition to listing the entity types, the [entities] section can be used to define just one additional aspect of the annotation: the hierarchy in which the entities are organized. This is optional, and the syntax specifying a hierarchy of entity organization consists simply of TAB characters at the beginning of each line. Such a hierarchy is interpreted an an is-a taxonomy by the system. For further information, see advanced entity configuration. The [relations] section defines binary relations between annotations. Relation annotations can mark, for example, a Family relationship between the entities identified by two Person annotations. Each line in the [relations] section defines a relation type, the entities it can associate and, optionally, the properties of the relation. The types of annotations that can be associated by the relation are identified using the syntax ARG:TYPE (where ARG are, by convention, Arg1 and Arg2), separated by a comma. The following example shows a simple [relations] section. As for entities, a hierarchy of relation types can be defined simply by placing TAB characters at the beginning of each line. For further information on relation definitions, see advanced relation configuration. The [events] section defines n-ary associations between other annotations (entities or events). The "event" category of annotations can be used to mark things that are stated to happen in text, such as two people getting married or a company going bankrupt. The basic syntax for defining events is similar to that for relations. Each lines defined one event type (or, more specifically, one event "frame" — possible combination of arguments), with the event arguments specified with a ROLE:TYPE syntax and separated by commas. The roles that event participants play in an event (ROLE) in the definition can be freely defined. The following example shows a simple [events] section. The [attributes] section defines binary or multi-valued "flags" that can be used to mark other annotations. For example, a Negated attribute could be used to mark the occurrence of an annotated event as being explicitly denied in text, or a Confidence attribute to mark an event as one of Certain, Probable or Doubtful. Each line in the [attributes] section defines an attribute type and the annotations it can attach to. For binary attributes, the possible values, true and false, are implicit; for multi-valued attributes, the possible values must also be specified. The annotation type (or types) an attribute can apply to are defined using the ARG:TYPE syntax used also in the definition of relations and events (ARG is, by convention, "Arg"). The values a multi-valued attribute can take are defined using the syntax Value:VAL1|VAL2|VAL3[...], where "Value" is a literal string and VAL1, VAL2 etc. are the possible values. The following example shows a simple [attributes] section. For further information on configuring the visual display of attributes, see advanced attribute configuration. Each of these sections must be present in the configuration file, but they can be empty. The [labels] section defines the labels to use in the display of the defined annotation types on the user interface. If no labels are defined for a type, the system defaults do displaying the configured type as defined in annotation.conf. The definition of labels has two primary uses: allowing labels used in the user interface to use arbitrary characters (see the section on type names), and defining abbreviations to use when there is limited space in the layout. The format of the [labels] section is simple: each line contains a set of strings, separated by pipe characters ("|"). The first string should correspond to a type defined in annotation.conf; the second is taken to be the preferred, full form to use for the type, and the remaining (if any) should correspond to its progressively shorter abbreviations. The following example shows a simple [labels] section. Note that the first and second strings will be identical in cases where the type as defined in annotation.conf matches the preferred way of displaying it. Also, space is permitted in labels, and space surrounding labels is ignored. The [drawing] section defines various non-textual aspects of the visual presentation. If no visual configuration is defined for a type, the system uses default settings, which can themselves be configured. The format of the [drawing] section is similar to that used in the other configurations. Each line contains the type of the annotation that the visual configuration applies to, and a set of KEY:VALUE pairs specifying the visual settings. The following example shows a simple [drawing] section. This example specifies that annotations of the Person type should be drawn with background of the color #ffccaa, and that arcs representing Family relations should be drawn with dark green lines ending with 5-pixel triangular arrowheads. fgColor: any HTML color specification (e.g. "black"), sets the color of a span text in the visualization. bgColor: any HTML color specification (e.g. "white"), sets the color of a span "box" background in the visualization. borderColor: any HTML color specification (e.g. "black"), sets the color of a span "box" border in the visualization. Also supports special value "darken", which specifies to use a darker shade of bgColor for the border. color: any HTML color specification (e.g. "black"), sets the color of an arc in the visualization. The special labels "SPAN_DEFAULT" and "ARC_DEFAULT" are recognized as setting defaults that will be used for types without specific settings. It is not necessary to define all aspects of the visualization (e.g. just Color can be given): defaults will be used for unspecified cases. The following example illustrates the use of these defaults. In this configuration, all annotation types except Person and Family will be draws using the specified default values. Further Person and Family annotations will also "inherit" the defaults for aspect of the visual presentation that are not explicitly defined, so that e.g. for the borderColor of Person annotations, the system, will use the special value darken. These sections are all optional: an empty file is a valid tools.conf. Note: the [options] section is supported since v1.3 (Crunchy Frog). See the page on upgrading to v1.3 (Crunchy Frog) for information on how these options relate to settings in earlier versions. The [normalization] section defines the normalization resources that are available. For information on setting up normalization DBs, see the brat normalization documentation. DBNAME: sets the database name (e.g. "Wiki", "GO"). The name can be otherwise freely selected, but should not contain characters other than alphanumeric ("a"-"z", "A"-"Z", "0"-"9"), hyphen ("-") and underscore ("_"). This name will be used both in the brat UI and in the annotation file to identify the DB. DBPATH (optional): provides the file system path to the normalization DB data on the server, relative to the brat server root. If DBPATH isn't set, the system assumes the DB can be found in the default location under the given DBNAME. HOMEURL: sets the URL for the home page of the normalization resource (e.g. "http://en.wikipedia.org/wiki/"). Used both to identify the resource more specifically than DBNAME and to provide a link in the annotation UI for accessing the resource. URLBASE (optional): sets a URL template (e.g. "http://en.wikipedia.org/?curid=%s") that can be filled in to generate a direct link in the annotation UI to an entry in the normalization resource. The value should contain the characters "%s" as a placeholder that will be replaced with the ID of the entry. The following example shows examples of configured normalization DBs. The first line sets configuration for a database called "Wiki", found as "dbs/wiki" in the brat server directory, and the second for a DB called "UniProt", found in the default location for a DB with this name. The [search] section defines the online search services that are made available in the annotation dialog. Each line in the [search] section contains the name used in the user interface for the search service, and a single key:value pair. The key should have the special value "<URL>" and its value should be the URL URL of the search service with the string to query for replaced by "%s". The following example shows a simple [search] section. When selecting a span or editing an annotation, these search options will then be shown in the brat annotation dialog. The [annotators] section defines automatic annotation services that can be invoked from brat. Each line in the [annotators] section contains a unique name for the service and key:value pairs defining the way it is presented in the user interface and the URL of the web service for the tool. Values should be given for "tool", "model" and "<URL>" (the first two are used for the user interface only). The following example shows a simple [annotators] section. The [disambiguators] section defines automatic semantic class (annotation type) disambiguation services that can be invoked from brat. Each line in the [disambiguators] section contains a unique name for the service and key:value pairs defining the way it is presented in the user interface and the URL of the web service for the tool. Values should be given for "tool", "model" and "<URL>" (the first two are used for the user interface only). The following example shows a simple [disambiguators] section. As for search, the string to query for is identified by "%s" in the URL. These shortcuts can then be used in the appropriate annotation dialogs to rapidly select the associated type. Hint: well-configured keyboard shortcuts can speed up simple annotation tasks a lot in particular when used with the Normal and Rapid annotation modes, which can be selected from the Options menu in the brat UI. 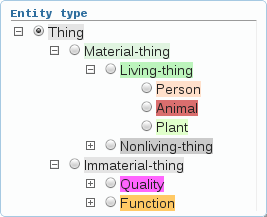 The above [entities] section defines Living-thing and Nonliving-thing as part of the is-a hierarchy, but does not make the types available for use in annotation. Relation definitions support the ability to set relation properties through the special attribute <REL-TYPE> as shown in the following example. The <REL-TYPE> specification currently supports two properties, symmetric and transitive, which can apply either separately or together. Multiple properties can be combined by using the dash character ("-"), as in the above example. The combination symmetric-transitive defines an equivalence relation. contain, equal and cross can be combined by the "|" character to express e.g. equal|cross for "may be equal or cross", and the value <ANY> can be used to express that any overlap is allowed. Any entity overlap not specifically allowed in an <OVERLAP> setting is assumed by the annotation validation to be an error. These are interpreted, respectively, as "a Contry annotation can be contained in an Organization annotation" (e.g. 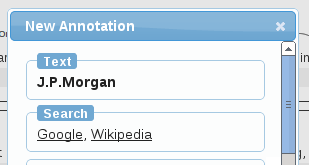 [Bank of [England]]), "Person annotations can have identical spans" (e.g. [[the Johnsons]]), and "any entity annotation may overlap in any way with any other" (see below for the <ENTITY> shortcut definition). Here, Transport events, for example, take a Theme which is any entity type and a Cause of any type. Defined macros can then appear anywhere in the configuration, and will be interpreted using simple textual replacement; any occurrence of a string defined as a macro (e.g. "<LIVING-THING>") in a configuration file will be processed as if its value (e.g. "Person|Animal|Plant") were written in its place. These shortcuts can make configurations with many types more concise and easier to read and write. Each annotation type consists of one or more characters, constrained to the set of alphanumeric characters ("a"-"z", "A"-"Z", "0"-"9"), the hyphen ("-") and the underscore ("_") character. However, these restrictions apply only to annotation.conf, which defines the types used by the system internally and in storage on disk. The corresponding labels appearing on the user interface, defined in visual.conf, have no such limitations, and can contain, for example, space or arbitrary Unicode characters. Additionally, the special value <EMPTY> can be used in visual.conf to specify that a label or similar marker such as an attribute glyph the should not be shown. The following (partial) configuration examples illustrate arbitrary characters in labels on the user interface.